You have to love black to pull this tattoo off. The bend of the elbow down a good inch is solid black as it goes down the black fades as if it is night. There are some trees with branches in the background with one tree with branches in the dead center. Up top are black birds flying and perched in the tree. This amazing tattoo is definitely different that the normal styles. 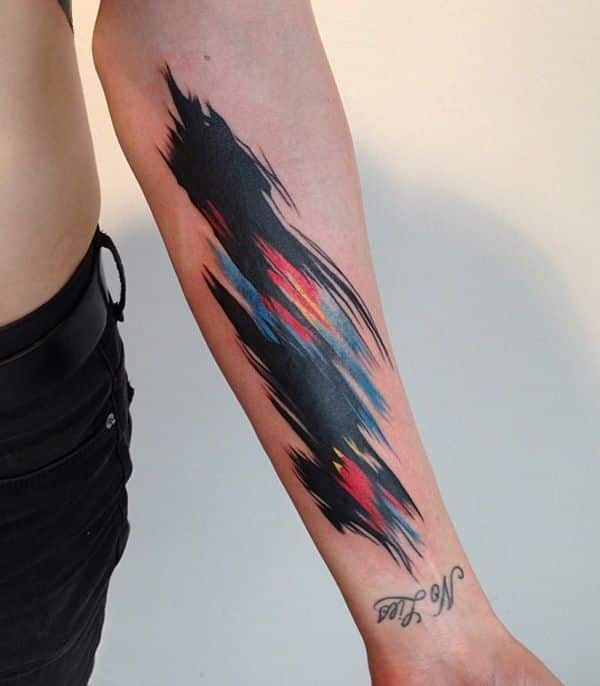 It features an abstract watercolor style up and down the forearm. At the wrist it says “No Lies” . The watercolor abstract is done in black, red, orange, and blue. 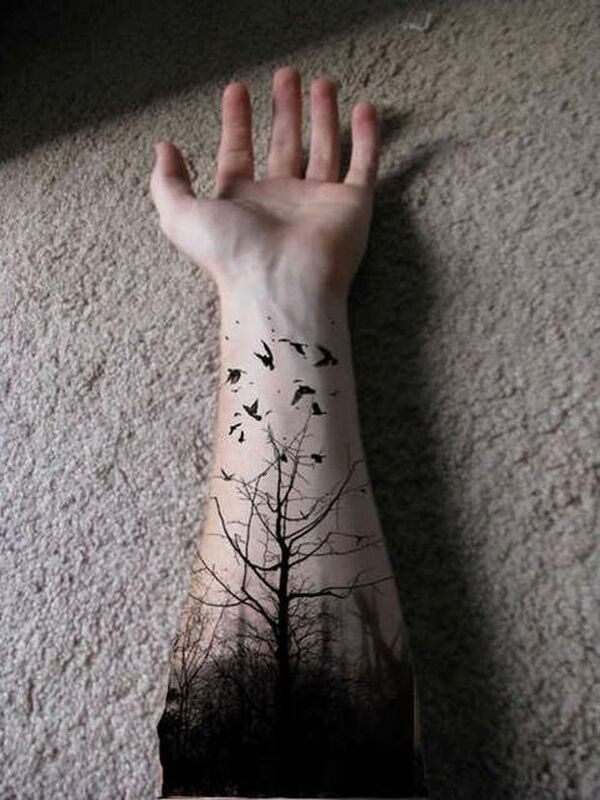 If you are looking for some amazing forearm tattoos this is definitely the route to go. The right forearm features a night time few with a tree branch and wolf inside of a large black outlined circle. The right forearm features a day setting with some yellow in the background a small tree brand a large bird flying overhead. This is also set in a large outlined circle. Now these tattoo sleeves are just too cool to not mention them. The left features a woman with rose color cheeks, pearls around her forehead, black long hair, and 2 roses in the hair. 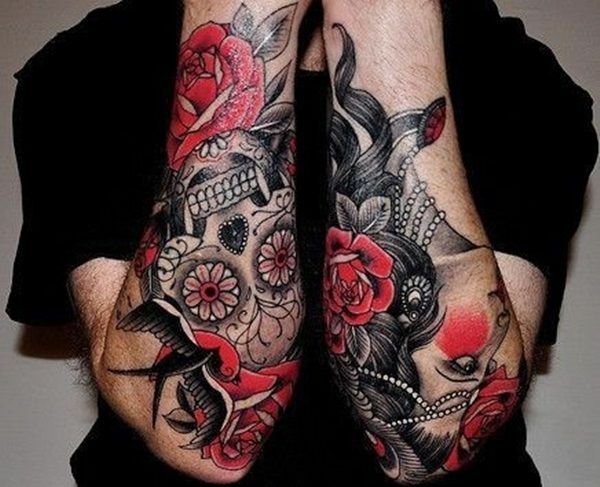 The right forearm features 2 red roses, a blackbird, a couple small roses and flowers, swirls, and vampire teeth. These are known as remembrance sailor tattoos. 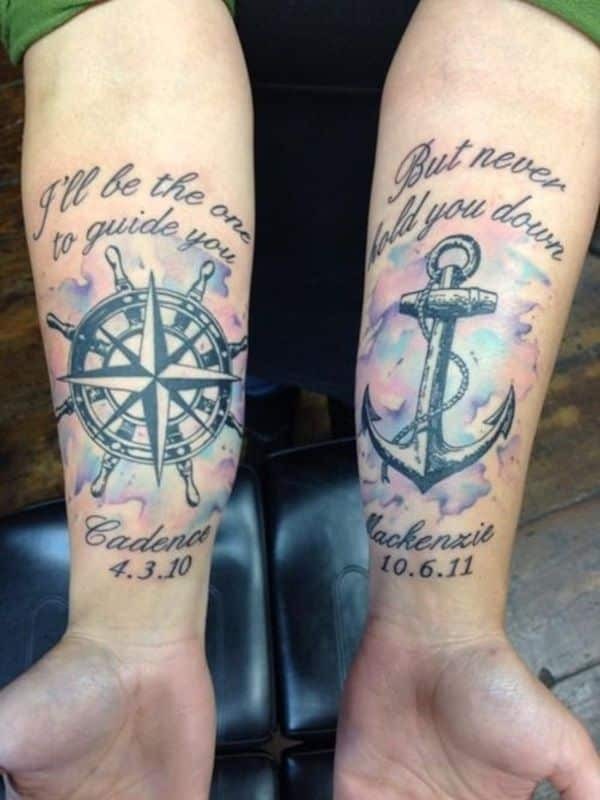 The one featured on the right forearm says “I’ll be the one to guide you” has a nautical compass with star and blue splash behind it. With the words by the wrist reading ” Candence 4.3.10″. Next, is the left that is a sailors anchor with the blue and purple splash behind it. Above the anchor reads “But never hold you down” then, by the rest reads “Mackenzie 10.6.11. For years compasses have guided many including sailors. 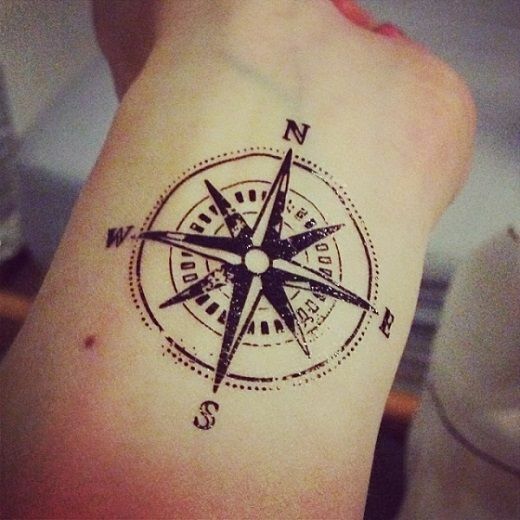 This is a forearm wrist compass tattoo in black. It is known to guide people to where they belong or should be. It shows a person that they know where they are going or have reached their destination. 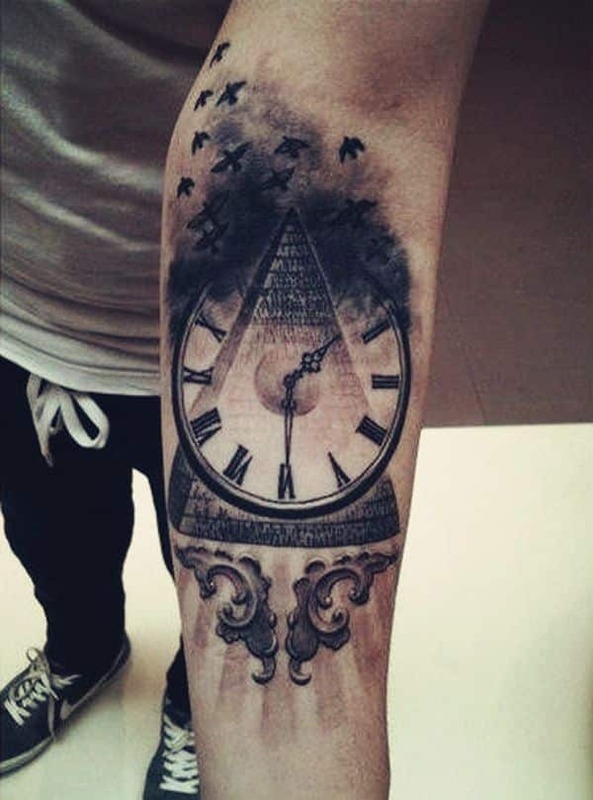 This next tattoo is known as a pyramid time clock done in black with birds flying away from it. The top of the pyramid looks like it is on fire with the smoke like detail coming up above the pyramid. 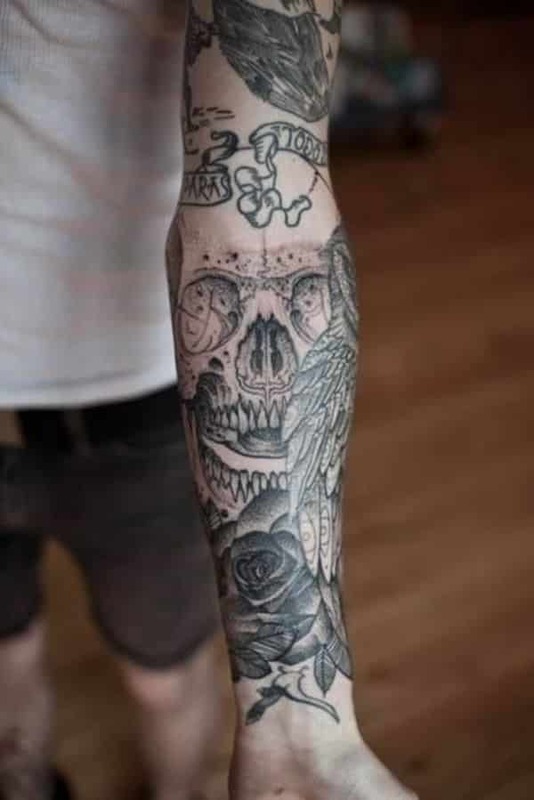 A forearm sleeve featuring a ribbon, skull, teeth, black rose, and an owl. It is highly detailed and shaded using a black color. It stretches from above the bend of the arm down to the wrist. This sleeve was made to be very detailed and artistic. This is a mountain tattoo with three mountains overlapping one another. 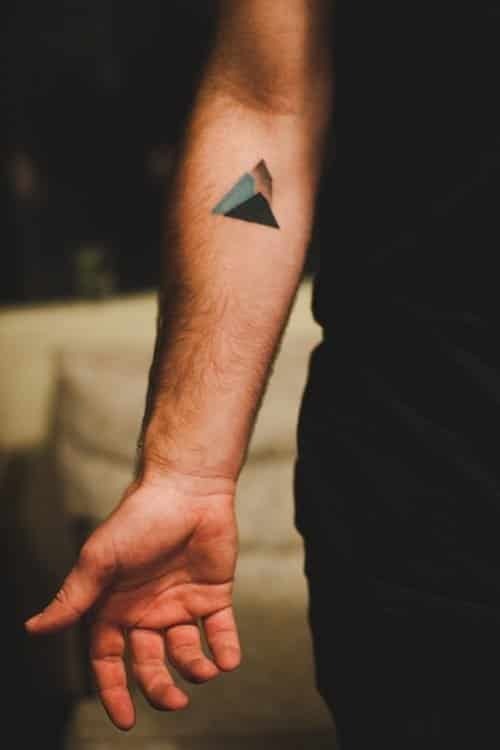 The one in the back is just a shaded black, then a greenish color tattoo a little too the left, finished off with a Black Mountain in the middle. 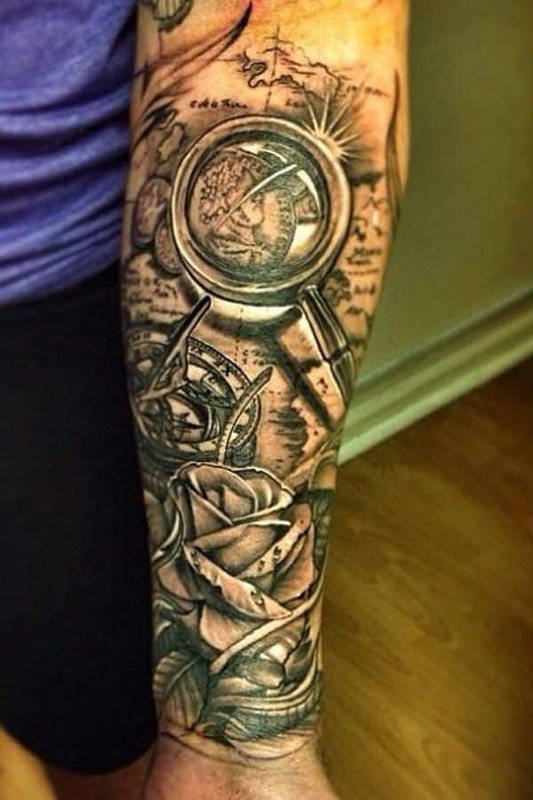 This very detailed sleeve tattoo has a map in the background, a magnifying glass showing what looks to be a fish. There is a large old fashion dial clock that uses the sun to tell time. It is finished with a large partially closed rose. The entire tattoo is done in black.